Pain from the ribs is usually described as sharp, stabbing pain. You also often feel increased pain when you take a breath. So it is not surprising that people are often rushed to hospital thinking something very serious has happened. If you have had a fall and actually sustained a fracture it is easy to understand and accept why the pain is there. But if you have sustained a, so called, costo-transverse sprain, which often does not relate to any major trauma, it is much more disconcerting and people often think they are suffering a heart or lung problem. It is common for people to think they are having a heart attack, hence the name 'pseudo angina'. Many names for the same condition? If you have already looked through some information on rib pain you may have found that the condition of rib pain has been given many names, costochondritis, intercostal neuritis, costo-transverse sprain to mention a few. The name intercostal neuritis, meaning inflammation of the nerve between the ribs, is often used if you have pain radiating along the ribs to the front of the chest. Medical textbooks often use the term costochondritis. It literally means inflammation of the rib cartilage. Costo-transverse sprain is probably the most accurate description for most cases because the problem responds very well if it is treated as a sprain and the radiation of pain along the ribs is not usually associated with any neurological findings such as numbness. Disc herniations can cause nerve entrapments but it is very rare in the thoracic spine (mid-back). If it does occur, it is usually associated with central stenosis, a condition that will give symptoms affecting your legs and possibly the control of your bladder and bowel. A costo-transverse sprain is an injury that people often wake up with. Sometimes it is caused by an awkward sleeping position or caused by turning in bed, or something that happened the day before but was too mild to cause significant pain right away. Chiropractors deal with rib pain on a regular basis and do it successfully. Rib pain tends to be acute in nature and therefore responds most often very quickly. Usually within 2-3 chiropractic treatment sessions the pain starts to subside. It is most important to note that the chiropractic treatments are directed towards correcting the underlying cause(s) of the condition(s) creating the pain symptomatology. Therefore, time must be given for optimal healing. Rib dysfunction do not only cause pain in the rib cage, it can also be felt deep inside the chest simulating pain from the heart, lungs, stomach and food pipe (oseophagus or gullet). It can also give arm symptoms and frequently affects people with breathing difficulties such as asthma. 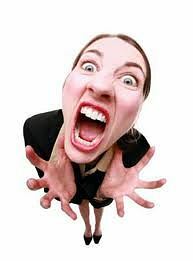 For some people the pain can become recurring and ongoing, and for these people the problem can be a source of great frustration. When we see them they have often had a number of chronic pain interventions such as long term non-steroidal anti-inflammatory painkillers, spinal facet and rib joint injections (cortico-steroids), which often gives only short-term relief. Click here for video "What is Kyphosis (Dowager's Hump)?" To help these patients in the long term, apart from treating the underlying spinal problem with specific chiropractic adjustments, it is extremely important to address the postural problem and core muscle weakness. Some of our female patients have had breast reductions, which has helped them to reduce the strain on the muscles in the mid-back with great success. Why do I feel pain in the front when the injury is at the back? Referred pain is a concept well known by chiropractors and is an important consideration in chiropractic treatment. Referred pain from the neck either goes up to the head or down the shoulder or arm. Referred pain from the lower back tends to go down the hip and leg, and referred pain from the mid back and ribs is usually felt along the ribs and even in the front of the chest. If the condition is severe enough the cartilage between the rib and the sternum (breast bone) can become irritated and inflamed. This creates a very sensitive area in the front of the chest, which is aggravated by movement and even breathing. Because of the location of the pain, it is extremely important that more serious conditions are checked for and ruled out before treatment starts. Chiropractors are trained in medical diagnosis and can do this confidently. If there are any suspicion of a heart related problem or other problems that chiropractic treatment can't help, the chiropractor will refer you to your doctor or hospital immediately. One condition that is often mistaken for a costo-transverse sprain is pleurisy, also known as pleuritis or pleuritic chest pain. Pleurisy is inflammation of the lining of the lungs, which may develop when you have lung inflammation due to infections such as pneumonia or tuberculosis.There are similarities in symptoms such as pain on taking a breath, coughing and chest movement. But the thing that will differentiate it from a costo-transverse sprain is the presence of a, so called, friction rub. This is a rough, grating sound caused by the rubbing together of the roughened lining of the lung. This can be heard using a stethoscope. Blood tests and chest x-rays will also help to diagnose the problem. Here is a list of some other medical conditions that can cause rib and chest pain. This list is not exhaustive, but covers the most common and some less common conditions that a chiropractor must consider before the treatment starts. 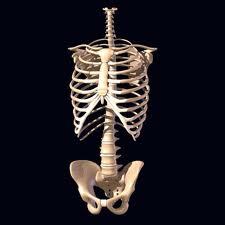 Ribs attach to your middle back (thoracic spine) and at the front at the breast-bone (sternum). The thoracic spine is made up of 12 thoracic vertebrae with 12 ribs on each side. Each rib has two joints at the back the spine and the top seven ribs have a joint at the front attaching to the breast-bone (sternum). The last two ribs do not attach to anything at the front and are therefore called floating ribs. Each rib connects to the body of the vertebra and to a bone on the side of the vertebrae called the transverse process, and sometimes to the disks. The joints are stabilised by ligaments and muscles. 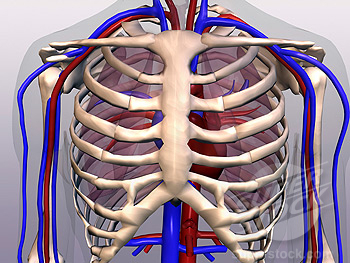 There are muscles found between the ribs and there are many muscles overlaying the ribs. There is also a nerve between each rib, which extends from the spine to the sternum along the course of the rib. All of these tissues can be damaged by a rib injury. Rib dysfunction is a term used by chiropractors to describe a mechanical problem affecting the joint between the rib and the thoracic spine. Injuries can cause the normal smooth gliding motion of the joint to jam causing pain. The pain may be so severe that you can hardly breathe and sleeping may be next to impossible. The surrounding muscles go into spasm and become very tender. Usually the pain is localised to the affected rib and is described as sharp or stabbing, which is aggravated by movement and even breathing. How does rib dysfunction affect other problems? The ribs have an important role to protecting the internal organs and form anchoring points for the muscles. Sometimes arm and shoulder pain is caused by a rib problem. Some of the neck muscles attach into the first three ribs. Upper rib dysfunction and associated muscle spasm can cause what is called a 'Thoracic outlet syndrome', which can cause impaired blood flow and irritate the nerves traveling down the arm causing numbness in the arm and hand. The upper ribs also work in tandem with the shoulder and shoulder blade (scapula). Full shoulder movement requires the scapula to glide over the ribs, called scapulo-thoracic movement. Rib dysfunction can cause restricted scapular mobility with pain on shoulder movements. Poor scapulo-thoracic movement can lead to rotator cuff injuries and should be evaluated when rehabilitating any shoulder injury. 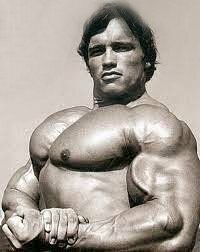 Poor chest expansion can also cause more serious complications such as pneumonia and breathing difficulties. The chiropractic examination is first aimed at ruling out serious medical problems. It is then followed by a detailed examination of the joints and muscles. The chiropractor assesses the movement of the individual ribs. There are two types of movement of the ribs, caliper movement and bucket-handle movement. The aim of the treatment is to restore the movement, reduce pain and reduce the muscle spasm. This is done using a variety of different protocols such as 'hands on' manipulative techniques, instrument (manual and computer-assisted) manipulative techniques, physiotherapy, low-level laser, acupuncture and specific exercises. Chiropractic is such a versatile treatment that is does not matter how old you are, if you are affected by osteoporosis or other medical problems. There is always a suitable treatment method the chiropractor can use that is safe and effective for you. Chiropractic treatment is always worth considering if you have any chest, shoulder or arm pain. Never delay having a check-up. The longer you leave the problem the more difficult it will be to treat. and provide treatment to deal with your rib/chest pain pain syndrome.